It was last month, I joined the 'We Knead to Bake' group led by Aparna, where a group of enthusiastic bakers will bake together an assigned item. I was looking forward to join the group when my fellow bloggers posted some delectable bread in their blog last year and I am really excited to bake together with the group and share the wonderful recipes on my blog. This month's assignment was to bake the soft and delicious Foccacia. I was totally sold when I saw the name of the bread that we were going to bake this month, when Aparna posted it in the group. Since I am a big fan of the Foccacia sandwiches, I knew that I had to try my hands in bread making from scratch. The name Focaccia originates from the ancient Roman “Panis Focacius” which was originally a flatbread that was baked on the hearth. Foccacia might look similar to Pizza, but the textures are different and taste wise it tastes far better than the pizza, at least that's what I felt when I made my own. 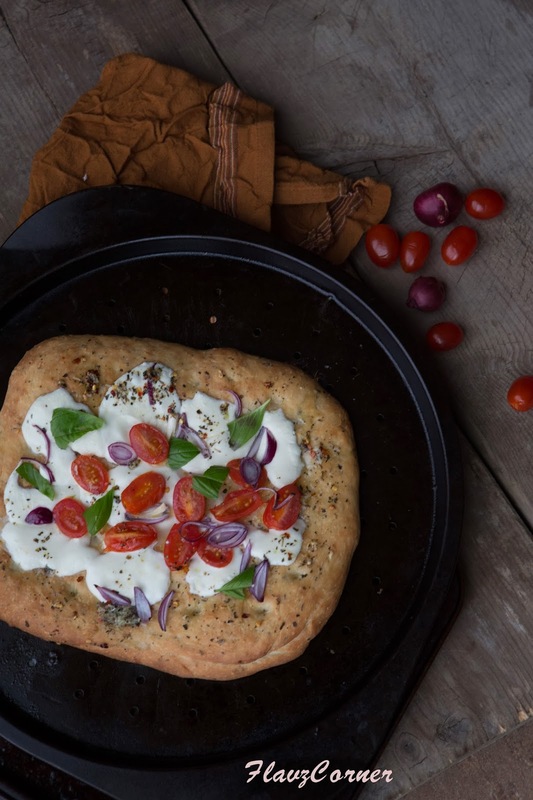 The herbed oil used in Foccacia uplifts the flavor of this bread. Foccacia can be served as a snack or can be used as sandwich breads. Foccacia can be served cold or warm. There are several versions of Foccacia available these days which includes different toppings. Foccacia Caprese is made with basic Foccacia base and topped with sliced tomatoes, mozzarella and basil. With the dough I made two versions, one with sliced tomatoes, mozzarella and basil topping for kids and I added sliced shallots and cherry tomatoes in our version. I loved the shallot version over the Caprese version. My kids skipped their lunch to each this bread and they ate even the tiny crumb of it. If you have never tried a Foccacia, it's time to bake your own. I would insist in doing so because it is worth a try and you will be totally in love with this bread. Put all the ingredients under herbed oil in a bowl and whisk together and keep it aside. Mix all the ingredients under dough using a stand mixture or food processor or hand. Add 1 tbsp of the herbed oil to the ingredients and knead till a soft elastic dough it obtained. Coat the dough with 1 tsp of herbed oil and keep it covered to rise for at least 1 hr or till the dough becomes double in volume. After 1 hr, punch down the dough and divide into 2 balls. Roll or spread the dough using hands to form a rectangular/round/oval shape and place on a greased baking sheet. Please note that you don't use flour in this step to roll the dough. Poke the rolled dough lightly with your finger to form dots. Allow them to rise for 20 minutes. Brush the dough with herbed oil and bake for 18 to 20 minutes. Take the baked base out. Increase the oven temperature to 450 F. Arrange the mozerella slices on the baked base. Top them with sliced tomatoes and basil. Drizzle the herbed oil over the toppings. Bake for 5 - 8 minutes or until mozerella starts to melt. Enjoy the warm baked bread as snack or use them as sandwich bread. Adding the herbed oil in the dough brings out the nice flavor on each bite into the bread. I used only 1 cup of warm water to knead the dough using my stand mixture. Depending on the flour and weather, the amount of water required might vary. So please start with 1 cup of water first and add as needed. Make sure that you bake the breads in 2 batches in the middle rack. If you try to bake the breads at the same time by placing one at the bottom rack and one in the middle, be careful that the bread at the bottom rack can get burnt easily. If trying to bake at the same time, take out the bread at the bottom rack around 15 - 16 minutes to avoid burning. The bread can be baked with just herbed oil and can be used in sandwiches. 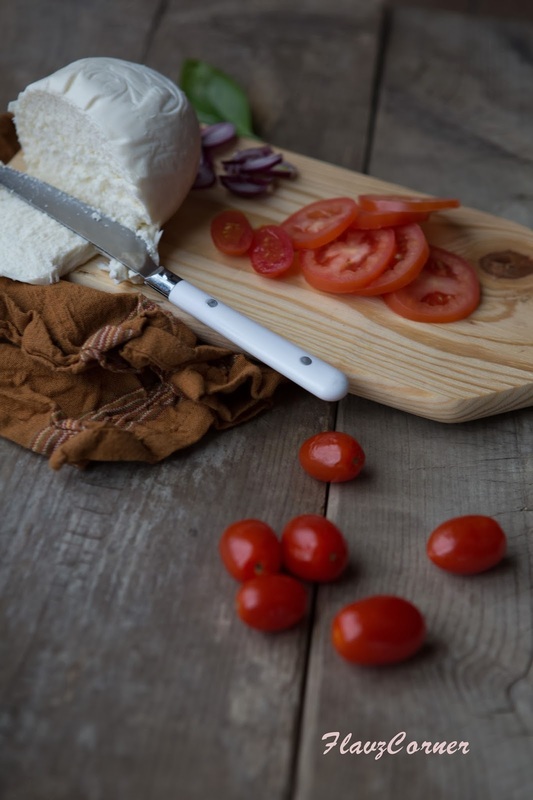 Keep the Foccacia caprese or focaccia with cheese toppings in air tight containers in the refrigerator. Wow, this looks totally delish! I always enjoy foccacia, but rarely do anything with it myself -- I really should. The flavors of this look so crisp and bright -- really a super looking dish. Thanks. Looks very delicious, definitely will try this recipe. I bet my kids will love your creation! I am seriously considered making foccacia, and it's 8 at night. Yours looks so good and fluffy. Love home made bread, nothing is better. Thanks for trying the recipe and I am glad that you all liked it. 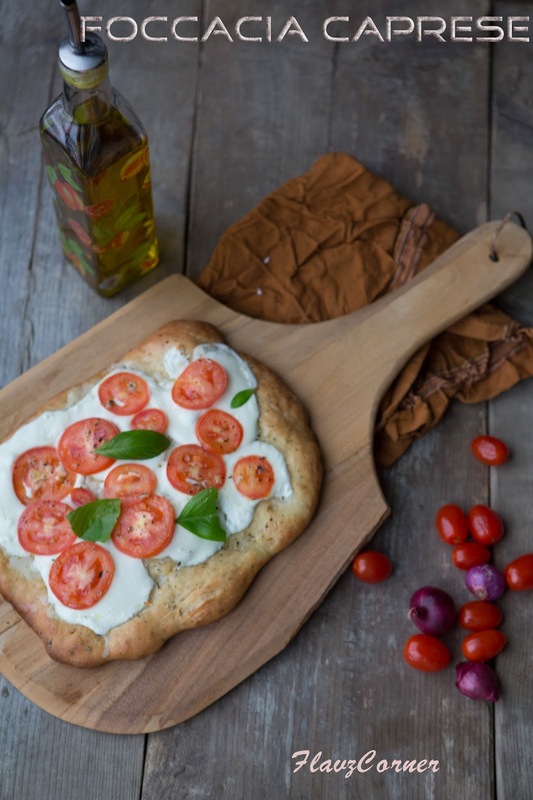 You can definitely make the foccacia with a mix of whole wheat flour and all purpose flour. Use 3 cups of wheat flour and 1/2 cup of all purpose flour. When you use wheat flour, the dough needs more moisture to make the bread soft. So increase the water amount. 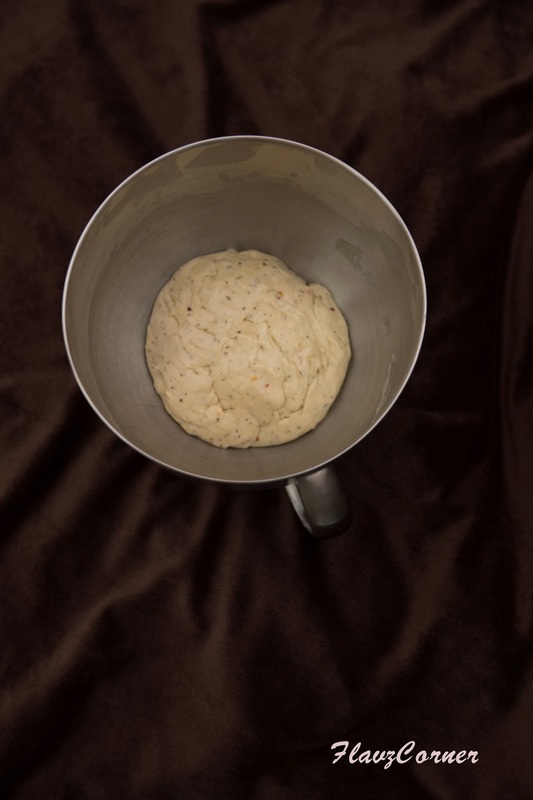 It should take around 1 1/4 cup of water or little more to make a very soft dough. The key is to get a very soft and loose dough. Adding the oil will make it non-sticky and it should turn out to be soft and fluffy.